Do you know the major red flags that can pop up in your interview process? For the last few blogs, I’ve been blogging about that all-important interview process. We’ve talked about the dangers of ignoring the red flags. We’ve investigated how to discover those red flags. Personally, I have never interviewed a candidate who was a a fit with one of my offices when they led with these questions. Are these red flags to you? If not, why not? They’re late to the interview just don’t show up! They obviously didn’t make an effort to dress in business attire for the interview (I realize this varies greatly by area, but you can tell if the person made an effort). They defend their low production and/or are accepting of a few transactions a year. They don’t have an idea of how they will change their production for the better. They have been sold on the companies that tell them they will provide them leads. They want to be hired on the spot. They’re not willing to do a 2-interview process, even when I explain the benefits to them. As you can tell from my red flags, my values and vision drive my judgement about these candidates. One broker’s red flags may be another broker’s acceptable standards. What are yours? List five red flags or knock-out factors. What process or system do you have to discover them? Decide whether you would absolutely not hire an agent who demonstrated that behavior, or whether it was a minor flag. Finally, how many of those minor red flags do you need to identify before you rule that candidate not suitable for your team? Want to streamline your selection process and recruit more winners? 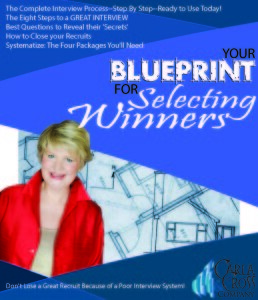 Check out Your Blueprint to Selecting Winners. I’ll give you great questions to ask. But, better than that, I’ll show you how to craft questions to discover exactly what YOU”RE looking for.